Navy Bean and Ham Soup made easy with canned beans, ham hocks, carrots, celery, dried rosemary and thyme, and a little bacon for flavor. This is the best Navy Bean Soup! It’s so easy to get caught in a soup rut, like a chicken rut, where you serve the same old same old recipes week after week because they are familiar and therefore easy. My go-tos for soup are usually this super easy Loaded Potato Soup, made with frozen potatoes = no peeling = WIN! and my Classic Chili, which is another filling bean soup recipe. 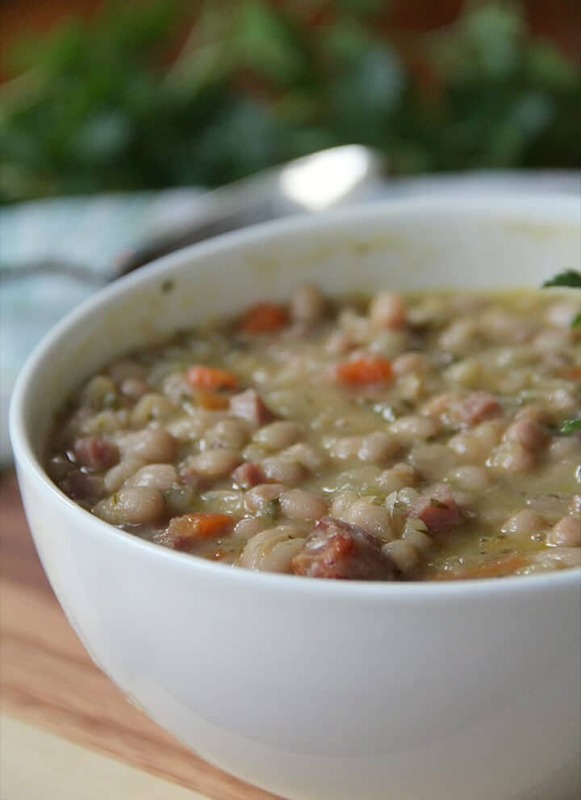 If you’ve been saving a ham bone since Thanksgiving, now’s the time to pull it out and make this hearty Navy Bean Soup with Ham. This is one of my favorite cold weather soups because it sticks to your ribs and warms you from the inside. And the bonus is that although the soup is filling, it’s low in calories due to the beans. I always keep some of this Navy Bean and Ham Soup in the freezer and usually make it several times throughout the year. The saltiness from the ham, combined with the creaminess of the beans and a slight touch of sweet carrot makes for a wonderful soup to share with friends or just have at home for family. Navy Bean Soup is a crowd-pleaser for sure! Navy Bean and Ham soup is fairly easy to make and takes about a couple of hours to cook, unless you’re using dried beans, in which case you need to account for the time you have to soak the beans. **Cook’s Tip: I usually just use canned navy beans but either works fine. **Cook’s Tip: If you don’t have a ham bone lurking about in your freezer, then you can buy a couple of ham hocks at the grocery store or your local butcher. I also add one of those little packs of diced ham unless I just happen to have leftover ham in the freezer. The ingredients for this Navy Bean and Ham Soup Recipe are staples so you probably have most of them in your pantry and fridge. And it’s a pretty forgiving recipe so if you’re missing one thing then just leave it out—you can use a different bean or different herbs if necessary. The great thing about this Navy Bean Soup with ham recipe is that you don’t need any fancy tools, just a great soup pot like this one. And you could always use some of these freezer containers to make it easy to save leftovers. I bought a set of those deli containers last year and they have been so useful! You get about 24 in a set and can use them for so many things. 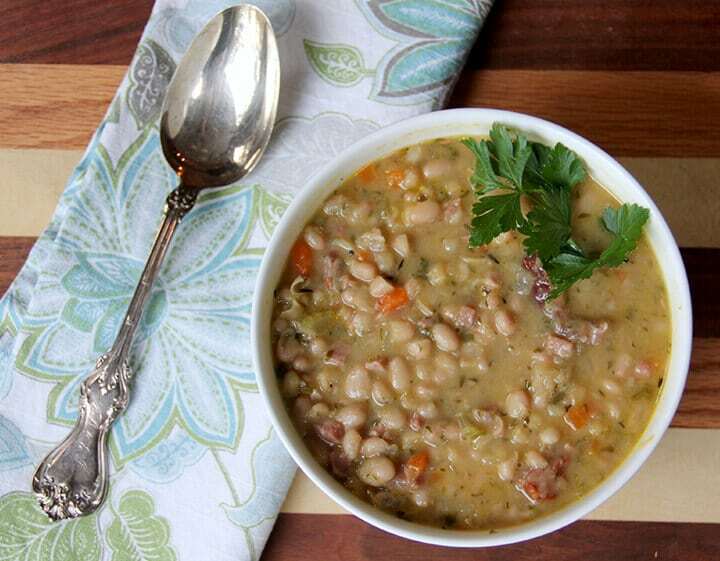 This Navy Bean and Ham Soup takes a couple of hours to cook, but the prep is fairly quick. The only chopping involved is with the vegetables: onion, carrots, and celery. And you can dice up some of the ham from your ham hocks too unless you just want to use the package of already diced ham. Start by cooking the chopped onions, carrot, and celery in melted butter in a large Dutch oven for about five minutes, then add garlic. Next you’ll pour in chicken stock and stir, then add the beans, ham hocks, herbs, and diced ham. 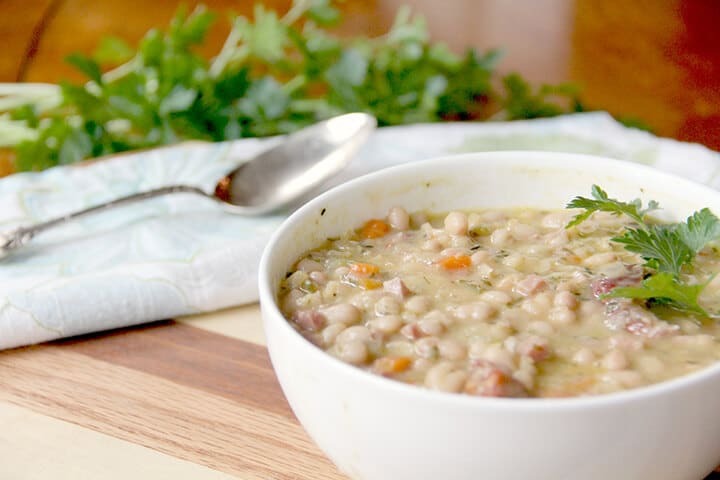 If you wanted a meatless meal, you could make plain Navy Bean Soup—but it’s so much better with a little ham to give it a nice, succulent flavor. Simmer the navy bean soup for a couple of hours, then chop the ham from the ham hocks. **Cook’s Tip: If you want to thicken the soup, you can take some of the beans and puree them in a blender then add back to the soup. We like good old-fashioned cornbread with this navy bean soup—well, I do, David just likes Jiffy Mix cornbread—but some nice crusty bread would be great as well. And some crumbled bacon on top is divine! And I don’t usually serve anything else. This soup is so hearty, it’s a complete meal. But…there’s always room for dessert. How about a lovely Cream Cheese Pound Cake? Or our family’s favorite Fudge Pie? Navy Bean and Ham Soup made with canned beans, ham hocks, carrots, celery, dried rosemary and thyme, and a little bacon for flavor. In large Dutch oven, melt butter over medium-high heat. Add onions, carrot, and celery and saute for five minutes. Add garlic and saute for thirty seconds. Add 1 and 1/2 quarts chicken stock, beans, ham hocks, parsley, thyme, rosemary, bay leaves, and diced ham. Add a little freshly ground black pepper. Bring to a boil. Reduce heat to medium-low, cover, and simmer for 1 to 1 1/2 hours. You may need to add additional stock. Remove ham hocks or ham bone and allow to cool enough to handle, then cut the meat off the bones and add to the pot along with the cup of diced ham. Discard the bones. If you want to thicken the soup, remove about 2 cups of beans and puree in a blender then add back to the soup. Taste and season accordingly with salt and pepper. The ham is usually salty so I don't add much salt until I taste the soup. Serve with crumbled bacon on top. Use canned navy beans—easy and convenient! Or you can substitute one pound bag of dried navy beans for the canned beans. You'll need to soak the beans per package instructions. Use a package of diced ham that you can pick up in the meat department of your grocery store. To thicken the soup, take out some of the beans and puree then add back to the pot. 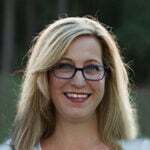 Update Notes: This post was originally published January 7, 2015, and on October 25, 2018, was updated with one or more of the following: step-by-step photos, video, updated recipe, new tips. Do you have to drain the beans if you are using canned? I have never had any success making bean soup. I must have tried a hundred different recipes. This recipe, WOW. It is easy to make and the taste is exceptional. Everyone I gave some to raved about it. I highly recommend it. Thanks so much, Pat! So glad you’ve enjoyed it!